And again I think this might be another record-setting update, so much new news! It's been awhile since I've had the time to send out my mailing list, so you are in for another treat today. Sit back, make some tea, and get ready for pretty pictures and good news. Firstly - we are back home from Nashville, where I was a teacher at The Fantastic Workshop! The workshop was amazing (fantastic even), had a blast! We are back home now and gearing up for our big annual Black Friday/Cyber Monday sale. Starting Friday and running all four days we'll have a huge sale, 25% off all prints & pins at Strangeling.com and StrangelingUK.com with coupon code THANKS2017 - I'll send out a reminder, don't worry. Secondly - I am GIVING AWAY a custom original painting! At 8pm Wednesday, November 22 we will randomly choose one of my Patreon Patrons, all members will be entered automatically (if you're not a member yet sign up here by 8pm Wednesday so you'll get in!!!). The winner will get to tell me how to finish the painting to your own specifications and will receive the original painting in your own choice of frame - details below! Your own chance to see your idea painting, and yes you get the original painting. I've got a couple of upcoming shows here in Florida at Disney Springs - my Mermaids show is December 9 (6-9pm at the Pop Gallery), and an autographing evening for Disney on December 16 (4-7 at the Co-Op). See them on my official events page here . For the Mermaids Show we'll be giving away an exclusive Dumbo Octopus Mermaid Pin to the first 100 customers - details here or scroll down below in this update! New paintings! I have two new paintings to show you (both the originals have already sold, but we have prints & canvases). "Unseelie Court: Gluttony" is here, "Faces of Faery 241" (featuring an American Staffordshire Terrier!) is here! 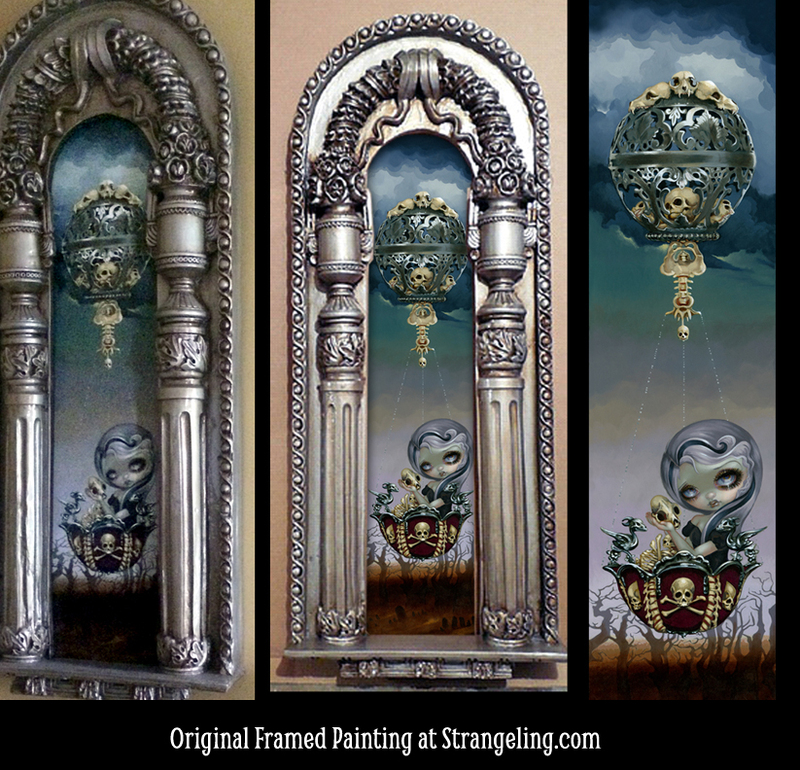 In addition, I finally have the original "Bone Chariot" painting AVAILABLE here - 52" high in a magnificent frame, details below with photos or click here. ACEO cards! I have a batch of brand new ACEO Cards HERE (Art Cards, Editions & Originals = ACEOs - trading card sized pieces of art created by many artists online). Each is up for auction starting at just on penny each, I only make one single ACEO card for each painting I do, so they are one of a kind, 2.5x3.5" canvas giclees that are each hand embellished by me in acrylic paints, signed and numbered #1 out of 1! Again, click here to see them all or to place bids. Pins, Pins, Pins - we have the November Pin of the Month - "Wolf Moon" - available to the public for sale here! We also have released a brand new Patreon Exclusive Pin - "The Scarecrow" - details about her are here. She is not for sale, but is an exclusive for all of our Patreon Pin Collectors (the $25 tier). If you are already a Patreon pin collector both "The Scarecrow" and "Wolf Moon" are on their way! If you are not yet, sign up here and you'll get both along with the Strangeling lanyard here. More Patreon news - I'm giving my Patrons a free BONUS coloring page "Fruit Dragonling" as a Thanksgiving Gift this week (probably tomorrow!) along with the Ninja Dragonlings coloring page this month. My coloring pages are Exclusive to Patreon (not found anywhere else), downloadable/printable, 1-2 new ones per month, and added to all the other Patreon perks for patrons at the $5+ tier level. Not a member? Get up there now and get in on the ground floor, click here for details. You'll get ALL the coloring pages so far immediately, and all the new ones as they are released. If you are already a Patreon Patron at the Coloring Tier, you can always see ALL the Patreon Exclusive Coloring Pages HERE and can download them as often as you like. My Butterfly Virtues figurine collection is now available worldwide and you can see actual PHOTOS (not just the concept art) popping up! See below for details. USA customers can order the collection now, immediate shipment as they are in stock here. Live outside the US? Burning Desires here has started offering the first couple in the series at their page here for worldwide shipping. Do you love beautiful handmade ink pens? I do! 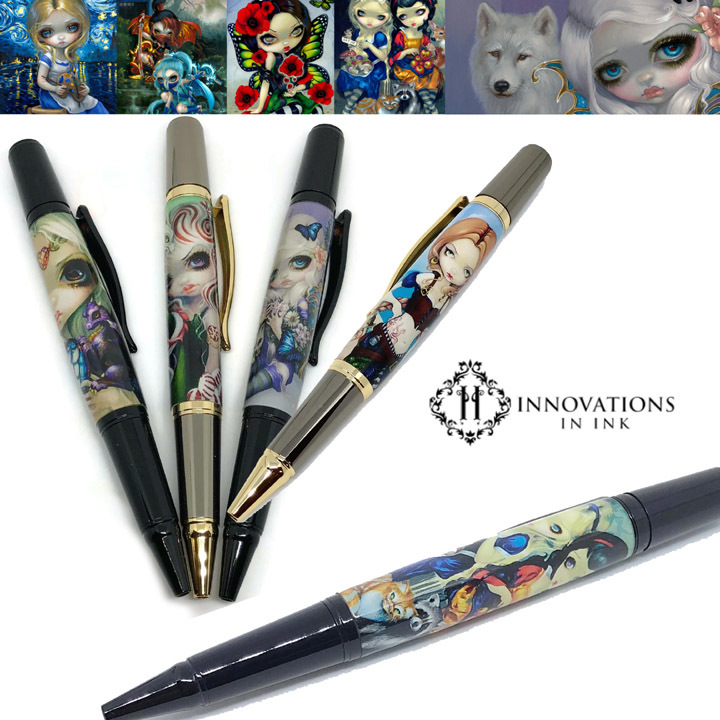 So does Michelle, the artist behind "Innovations in Ink" - she has licensed many of my paintings to put on her handmade artisanal ink pens and you can see them here . You can also see & purchase them in person at the Pop Gallery at Disney Springs - they really must be seen in person to be appreciated (the ones at Pop Gallery actually contain my physical signature on a panel inside the pen itself - so neat!). Again - the entry deadline for my Original Custom Painting is 8pm Wednesday night, Eastern Time. All tiers and all members of my Patreon page here will automatically be entered literally up to the very last second at 8pm, so get up there if you can! Sign up at Patreon here! Yes, you'll get your own custom original painting - the one in the photo above. It's not a huge painting, but it's YOURS, and you can pick either of the picture frames shown here too (or if you want to frame her yourself, you can do that later). *Wings? Is she a fairy? Maybe she's a mermaid? *Background/theme (whatever I can fit around her!) Is she in space? Underwater? Surrounded by spiders? If can fit it in, I can paint it. I'll then finish the painting to meet your specifications, email you a pic for your approval, then I'll varnish, frame and mail you the original painting itself for you to keep. *I can't paint Disney characters for you, I can only do that for the Walt Disney Company. *Other people's intellectual property (I can't take characters or artwork or trademarked images that belong to other people, movies, comics etc.) - unless you yourself have obtained written and verifiable permission and/or a licensing agreement from the IP holder. *I cannot transfer the copyright of the finished piece, as the artist I retain all the copyright and reproduction rights to the image. If you are interested in hiring me to create a "work-for-hire" commissioned piece this is not the place, just contact me privately, lol. *I cannot squeeze in additional faces. Please don't ask me to fit in a weirdly small person next to her to try to get two-for-one, lol - it will look bad and oddly unbalanced. I can totally fit in a cat or a little dragon, but no more humanoids should be added in this piece. Thank you all for the support! As long as you are signed up at my Patreon page here you will be among those included in the original custom painting giveaway (and zillions of other fun giveaways and other good stuff). Thank you all so much for your support, I could not do what I do without you. Here's one of the paintings I started at the Kansas City Renaissance Festival - the sixth of my Seven Deadly Sins from my Unseelie Court series - all finished! So much is going on in this piece - you can see more details here and the others in the series here . The original painting sold, the Masterpiece Limited Editions all sold immediately to my Patreon Patrons before they were available tot he public, but we have prints & open edition canvases available now! Prints & original painting are here - we ship WORLDWIDE. The original painting of Bone Chariot is AVAILABLE here! “Bone Chariot” is an original acrylic painting on approx. 40″x11″ panel – Massive 52″x21″ magnificent frame as shown above. I am selling this original painting myself (the previous purchaser defaulted on their payments), if you have any questions or are interested in interest-free payment installments email me at JasmineToad@aol.com – she is $6800 including frame (I recommend keeping this frame as it is a very odd size and the painting was shaped to fit this specific frame). She is of course the inspiration for the new Bradford Exchange/Hamilton Collection series and is a very popular piece (we sold out the masterpiece editions on this painting almost immediately). In addition to the original painting, we also have prints & open edition canvases available now here! An additional fifth special "Happy Thanksgiving" bonus coloring page for my Patreon Colorists featuring "Fruit Dragonling" will be released later this week too! Already a 5+ Patron? You can always get any past or present coloring pages at this link here (or just click the Coloring Page tag under Posts at my Patreon page). 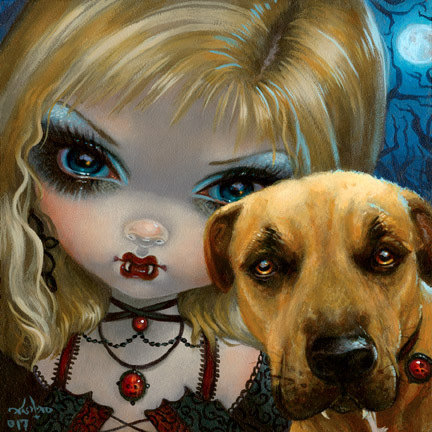 This cutie featuring an American Staffordshire Terrier is the result of one of my custom paintings! She was commissioned by the same client who commissioned the Vampire Chihuahua FOF earlier this year, hehe. The original painting is of course sold, but we have prints and canvases available on my website. Firstly - the November Pin of the Month is "Wolf Moon" - based on my painting of the same name - a wolf maiden and her companion in front of a full moon. She's for sale to the public for $12.99. She has been mailed out to all our Patreon Pin Collectors, and is also available to the public to purchase at Strangeling.com with all the other pins here. Secondly - now that we have run out of Patreon Exclusive "Paisley" pins, our next Patreon Exclusive Pin is "The Scarecrow" (perfect for late autumn!). If you are already a Patreon Pin Collector, yours is already in the mail! If you are not, you can sign up at the $25 tier here at Patreon and you'll receive both "The Scarecrow" AND "Wolf Moon" and the Strangeling Lanyard right away (international shipping at Patreon is always included!) here . The Scarecrow pin is not for sale to the public, and is an exclusive gift for my Patrons. 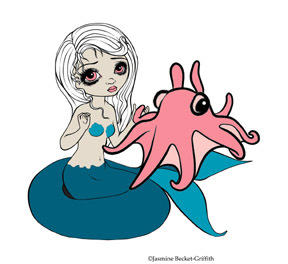 Here's the concept artwork for my upcoming "Mermaids" show giveaway pin! It's official - the Pop Gallery will start giving away the "Dumbo Octopus Mermaid" Exclusive Pins at 4:00pm on December 9th to the first 100 customers. Yes, customer does mean that you need to buy something (it can be small, but it needs to be a Jasmine Becket-Griffith item of some sort). More details about the event are here. They will have 100 pins, one pin per person limit, person must make a purchase (ie, if you and your two friends come and buy a print = only one pin. If you and your two friends come and each buy a print = 3 pins). This is quite a special giveaway, so they are going to follow this rule strictly. I myself will be showing up at the Pop Gallery at 6pm, so you have two hours before that to snag a pin if you are an earlybird. 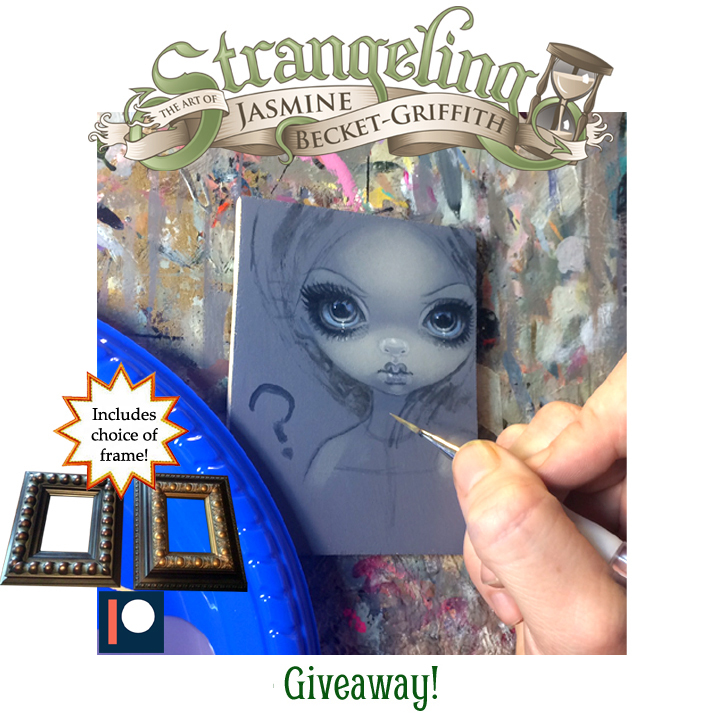 They'll keep giving away pins to customers making Jasmine Becket-Griffith purchases until all 100 pins have been given away! I'll be there in person from 6-9pm and can autograph anything you want - anything you bring from home or buy at the show. We'll have the Mermaids Coloring Books, I'll be debuting a couple new Mermaid paintings, we'll have tons of other mermaid themed (and non-mermaid themed) prints, canvases, books, pins, jewelry, paintings, oracle decks & more. Again - pin giveaway starts at 4PM! Free with any JBG purchase. These pins will NOT be for sale elsewhere. Any extra pins will be randomly given away (NOT sold) to Patreon Pin Tier Patron. More details about the Mermaids Event are here. International Customers can now order here at Burning Desires! Previously I only had the concept artwork to show you, but I now have the actual photos of the final finished statues themselves - yay! See above or look at Hamilton's website here if you'd like to zoom in, etc. This is my new figurine collection called "Butterfly Virtues" - in stock NOW at the Hamilton Collection with express shipping available! International (non-US) customers can order worldwide from Burning Desires here (they have the first two up now, more to come). 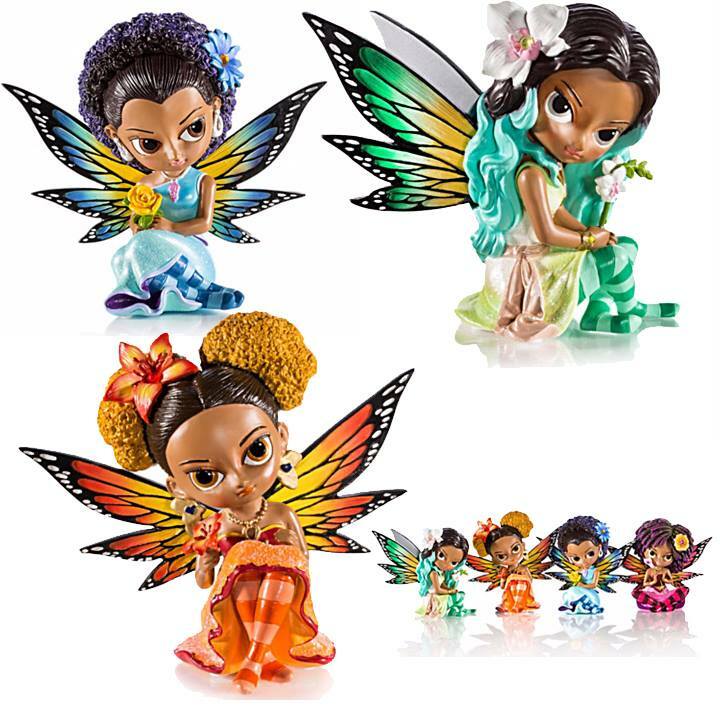 This new collection feature beautiful fairies with butterfly wings and incorporates some new elements such as metallic detailing, jewels, and a wide variety of skintones and hairstyles. USA customers can order the collection now, immediate shipment as they are in stock here. Each is about 4" high, hand painted, metallic & jeweled accents, Limited Edition and gorgeous. The first one comes automatically, and a new character comes about each month! US customers can also order via telephone - 1-877-595-9506 - call the Hamilton Collection and let them know you want to order Jasmine Becket-Griffith's "Butterfly Virtues" collection! Or just order here. Live outside the US? Only want to order one and don't want the whole collection? Order worldwide from Burning Desires here - they have the first two up now and the others will follow soon. I'm pleased to announce my partnership with Innovations In Ink! Super high-end handmade artisanal ink pens. It is difficult to describe/show off online the hours of work and level of quality that goes into each and every one of these. Each is hand-turned and created by my friend Michelle, an artisan pen crafter, and you can see them here and also IN PERSON at the Pop Gallery located at Disney Springs here in Florida. If anybody has any questions please contact Michelle at Innovations in Ink on their website (I'm just the artist who did the paintings, lol, I do not make or sell the pens). Pssst - these would make amazing Christmas gifts!